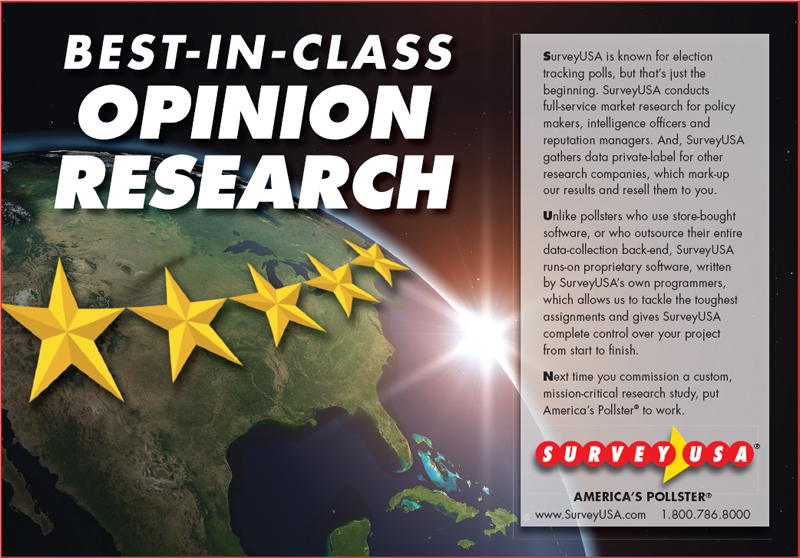 SurveyUSA conducts custom, local opinion research for universities, non-profits, local and state governments and small to medium-sized businesses, ad agencies and public relations firms. 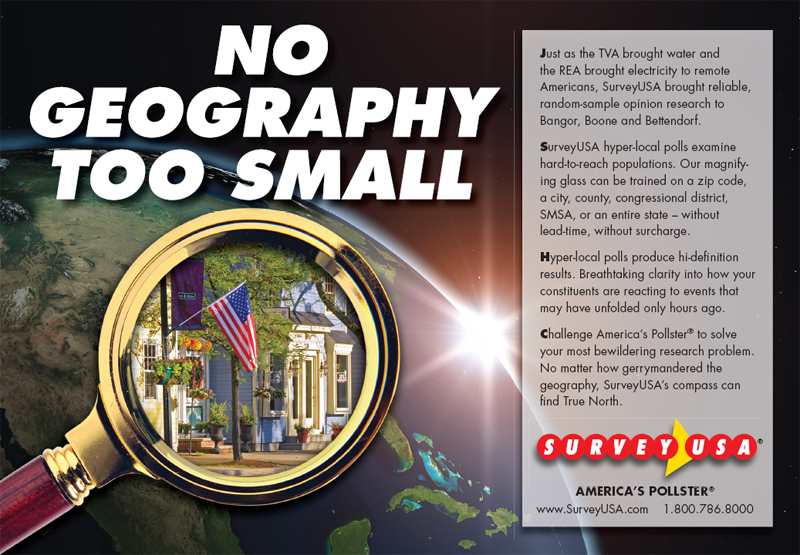 Unlike other research firms whose focus is global, SurveyUSA’s focus is local. We’re right in your backyard. to Reno, Rochester, and Roanoke. 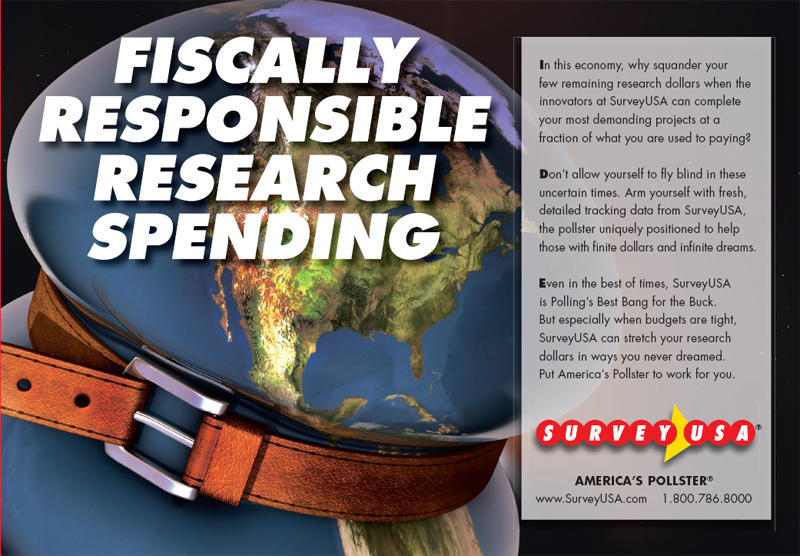 Independent, apolitical and non-partisan, SurveyUSA conducts more opinion surveys of cities, counties, MSAs, DMAs, Congressional Districts, and states than any other research firm. Well-written, Hi-Definition, local, custom research is SurveyUSA’s bread and butter. for our demanding clients, without sacrificing quality or integrity. 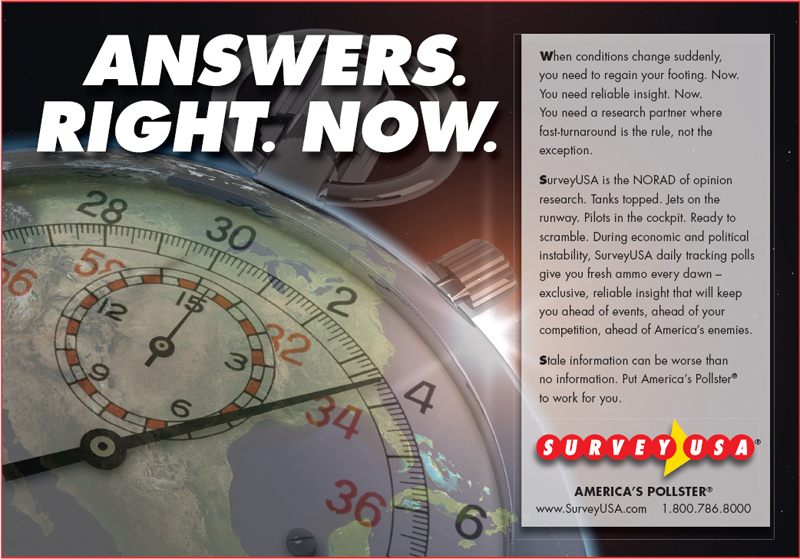 Early in the 1990s, SurveyUSA disrupted the opinion-research landscape by demonstrating that surveys did not need to take weeks to complete and did not need to cost a fortune. Before then, research was so expensive and took so long that few could afford it, and even those that could commissioned two or at most four surveys a year. Because surveys launched so infrequently, everyone in the organization worried that if they didn’t throw in their five or six “must-have” questions, it might be six months till they got another chance. The result was a bloated questionnaire that took a respondent 40 minutes to wade through and took data analysts a month to parse. 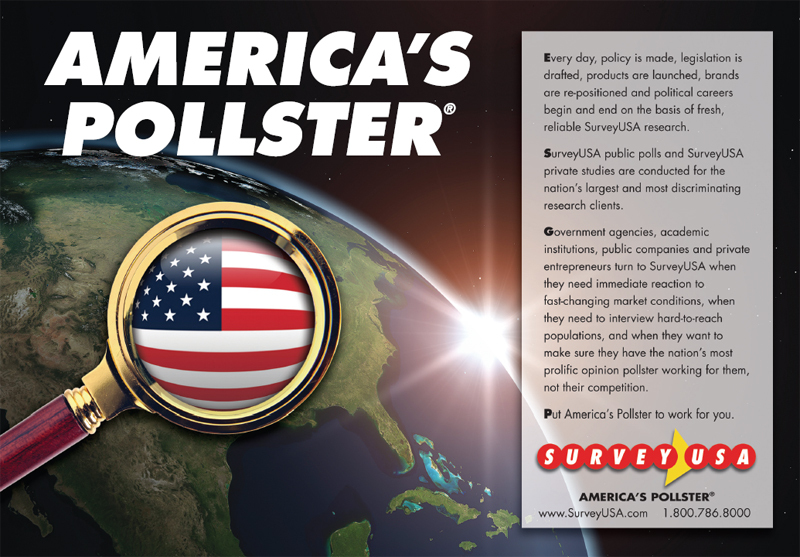 SurveyUSA dismantled every one of these paradigms: our analysis of the opinion research landscape showed that a nimble outfit could carve a niche. Simplified questionnaires could be written and launched same-day. Technology could reduce the time needed for interviewing from weeks to days. Analyses could be written in an afternoon, because there wasn’t 746 pages of 11 x 17 line-printer data to wade through. Best of all, no sooner had you received your results than you had learning, and armed with that learning, you could repeat the cycle. Research became iterative. And we’re talking about 1993. Today, 25 years later, some of our competitors are newly discovering the advantages of being fleet of foot. They have seized upon the term “agile” to describe their approach. But ocean liners cannot be turned into ski boats. A retrofit is not possible. Only water craft purpose-built to twist and maneuver in a blink can do so. Choose America’s Neighborhood Pollster™ when time is of the essence. What does it cost to take a survey? anywhere from $8 per person to $800 per person, somewhere in that range. And the caterer is not being coy. The price range reflects the reality that different people dream of different weddings. In the research business, the range is almost as great. 1. Who is eligible to answer the questions in the survey? Just homeowners with 2 mortgages and a cat? Only those with a front-loading Electrolux washing machine? 2. Where are your respondents? Anywhere in the 50 United States? Only in the state of Idaho? Only in the greater Cincinnati TV-viewing area? Only in Texas’ 24th Congressional District? Only in Caddo Parish, Louisiana? Only in the Kirkwood School District? Only in Zip Code 10022? How you answer Question 2 will narrow us down to a range. 3. When do you need research results back in your hands? Before the sun goes down tonight? How you answer question 3 will tell us whether your project is feasible. In general, the more time you give us, the lower the cost. And in general, the four weeks leading up to a Presidential election, when SurveyUSA resources are fully engaged on state and local election polling, are more expensive than other times. The more demanding your time requirements, the more likely it is we may need to charge a premium, which allows you to jump to the head of the queue. 4. What is the smallest sub-population that needs to be extrapolatable? Here is why we ask. Let’s say you tell us that you want to interview any adult in the state of Ohio, and the smallest sub-population you plan to examine is the difference between Ohio men and Ohio women. Great. That gives us a place to start: in a survey of (say) 600 adults, there will be approximately 300 men and 300 women, enough men for you to extrapolate men and enough women for you to extrapolate women. But, by contrast, if you say to us, instead, that it’s important to you to examine the difference between Ohio Republicans, Ohio Democrats and Ohio Independents, where, for argument’s sake, each represents 33% of the Ohio population, then we may recommend increasing your overall sample size to 1,000 respondents, so that you have approximately 333 Republicans, 333 Democrats and 333 Independents to analyze instead of just 200. Further, if you say to us that it’s important to you to examine the differences between white Ohio residents and African American Ohio residents, we may recommend increasing your sample size to 1,500 adults, which would give you approximately 180 African American respondents. Or, if appropriate, we may recommend to you a smaller total number of interviews with a unique oversample of African Americans. To extend this example to its logical endpoint: if you say to us that it’s important for you to interview Ohio’s few Latinos — in Spanish — then the cost of your project may increase exponentially. 5. How many separate pieces of learning do you hope will come out of your survey? This is an important question, but it is different than asking you how many questions the respondent will answer. Sometimes, you can learn something with one question, but more often, it takes a series of questions to produce a single piece of learning. SurveyUSA recommends that you inventory every separate piece of learning you want to come out of your survey by imagining how upset you will be if you conduct the survey, pay for it, but only then realize you didn’t learn all that you had hoped. We encourage clients to complete the following sentence and email it to us. Some learning can be achieved in 2 questions. Some learning can only be achieved by asking 20 questions. Sometimes a single, critical insight can be learned in 3 minutes of a respondent’s time. Sometimes, key learning takes 9 minutes of a respondent’s time. But most of the research that SurveyUSA fields is typically 15 to 45 data points, which carve typically 3 to 5 minutes out of a respondent’s already busy day. Once you have worked through these 5 questions, and once we have talked you through your project, SurveyUSA can typically give you a price within the hour. 100% of SurveyUSA’s hi-def focus is local. We conduct fresh, local, custom market research studies for local advertisers, local ad agencies, local PR firms, local governments, local non-profits, and local media. We are active in all 50 states, with unmatched local expertise surveying Nielsen DMAs, Arbitron ADIs, SMSAs, counties, cities, and zips. Custom pre-ad-campaign and post-ad-campaign tracking studies are our specialty. Nimble and crisp, SurveyUSA outperforms bloated competitors who use outdated approaches to solve problems that cry out for innovative solutions. When you want to test “creative” locally, understand your brand’s positioning locally, segment your market locally, analyze your local competition, or substantiate a claim with fresh, local, custom primary research, turn to SurveyUSA, America’s Neighborhood Pollster™. We help small clients think big. When your organization is at a crossroads, and it’s time to reach out to a market research company, think about whether you want to speak to a visionary or a functionary. If you want to speak to a functionary, Google the list of the world’s 50 largest market research firms and try to make contact with one of them. See what kind of a junior account executive you end up talking to. Ask how long they’ve been in their job; ask how long they’ve been at their company. Ask how long they have worked in market research. At SurveyUSA, when new clients call, they reach a principal — someone who has been at SurveyUSA for more than 20 years. For sure, they reach someone who is nimble, crisp, and fast on their feet. For sure, they reach someone who was part of reinventing telephone research in 1993 and inventing internet research in 2010. For sure, they do not reach an order taker. They do not reach a clerk. They do not reach someone who can’t tell the difference between Mason City and Sioux City Iowa, between Hazzard County and Henry County GA, between Sparta MS and Sparta IL, and between Mayberry and Mount Airy NC. Not uncommonly, when SurveyUSA looks, there will be 100 or more data points to be gathered. In today’s world, 20 or 30 minutes is an eternity. Nobody has 20 or 30 uninterrupted minutes to do anything. We live in a world where the average attention span is 5 seconds — 140 characters. This puts SurveyUSA in a bind. We can agree to field the research, knowing that it is the wrong thing to do, pocket the money, and go to confession, or we can push back and tell the client, “It’s really important that we, at a minimum, cut your instrument in half, and better yet, into quarters, so that no one piece of the project is more than four to six minutes long.” Four to six minutes is the outer boundary of what a respondent might be willing to sit through in today’s world, before the respondent begins to feel like he or she is being abused. “Respondent abuse” is a very real phenomenon. It happens too often because clients are focused on the client’s needs, and researchers are focused on the researcher’s needs. Nobody is focused on the respondent’s needs. SurveyUSA is focused on the respondent’s needs. In 2017, SurveyUSA was honored to receive a QUEST Award for Research Excellence, for designing surveys that are easy for the respondent to complete. The importance of the award is that is is not the subjective opinion of a panel of judges, but rather, it is the algorithmic output to a computation, devised by Survey Sampling International, that measure how much effort it takes a respondent to complete a survey. No research firm intentionally abuses a respondent. Our competition just neglects the respondent to such an extent that it becomes abusive. Did SurveyUSA’s unwavering focus on the respondent and aversion to respondent abuse occur by accident? Is it something that SurveyUSA discovered late in life? Back in the 1980s, before he founded SurveyUSA, SurveyUSA CEO Jay H Leve was in charge of an outfit at Citibank world headquarters called “Humanware.” Humanware existed before the home computer had even been invented, before “user friendly” was an idiom, and way before anyone knew what the Internet was or would become. Humanware had one job in Citibank’s R&D process: to prevent the computer hardware guys, who were focused on hardware, and to prevent the computer software guys, who were focused on software, from losing sight of the individuals who ultimately had to use the cash machines and home-banking appliances that Citibank was developing. Dissimilar as 1980s consumer banking may seem to 2017’s opinion research, the two disciplines require almost exactly the same set of skills: The ability to ask an unambiguous question, and the ability to solicit an easy, honest answer, without intimidating the customer or the respondent. The genuine genius who invented the concept underlying user-interface design and who coined the term “Humanware,” Larry Weiss, today owns his own market research company, LineScale Research. If you can afford the Master, hire LineScale. If you prefer to work with one of his disciples, hire SurveyUSA. Winner, 2017 QUEST Award for Research Excellence, both as Best Internet Researcher in the United States for surveys administered to those on a mobile phone, and as Best Internet Researcher in the World for surveys administered to those on a mobile phone, as calculated using the objective measuring tools at Survey Sampling International (SSI). Official Press Release here. Ranked, 2016, by the independent website Five Thirty Eight as being in the 93rdpercentile for survey accuracy, the 97th percentile for survey predictive value, the 98th percentile for absence of partisan bias, and the 100th percentile for most prolific pollster. 372 research firms evaluated. Results here. “SurveyUSA Performed Strongly,” 2010, New York Times. “Pollster of the Cycle” Award, 2009, Rothenberg Political Report. “The Real Winner of Tuesday’s Election,” Karl Rove & Co., 11/05/09. “On the Nose,” Wall Street Journal, 2008. Ranked #1 in USA, Pollster Ratings Version 3.1, Nate Silver. “18 of SurveyUSA’s final polls were the closest for that state, almost twice as many as every other major poll PUT TOGETHER!” Poli-Pundit, D.J. Drummond, 11/06/04. A client who has rolled out a new product in select grocery stores in three geographically diverse, tightly circumscribed areas shows SurveyUSA a map of exactly where the stores are located. The client describes an advertising campaign that is planned. 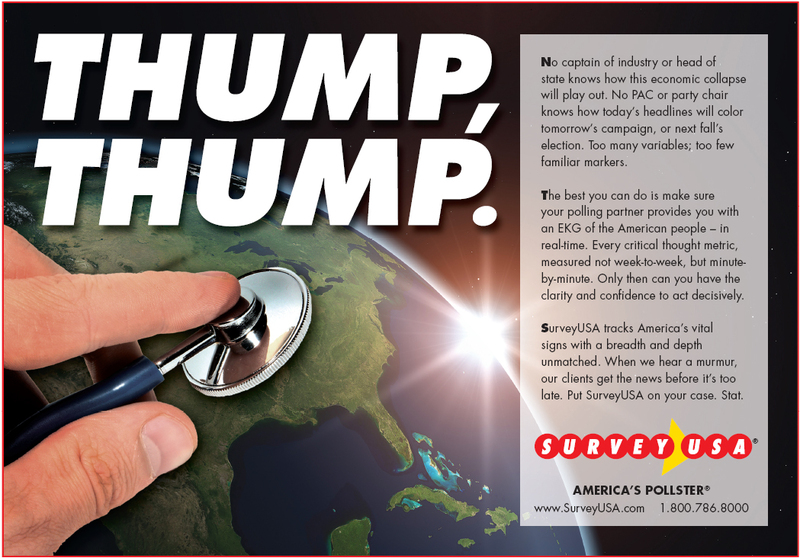 SurveyUSA designs three separate pre-ad campaign studies and three separate post-ad campaign research instruments, and then tailors the field period so that the pre-campaign is in the field immediately before the advertising starts, and the post-campaign is in the field immediately after the campaign ends. Each geography is tiny — a handful of zip codes. But SurveyUSA is able to laser-target the hyper-local geographies and gather timely data for the client’s evaluation. A local TV station may hire a new anchorman from another part of the country. Will that out-of-town anchor go over well in our client’s viewing area? No need to guess: SurveyUSA is able to show a cross-section of viewers video of some of the anchor’s work from his current place of employment. Viewers react. The sentiment is disproportionately negative. The client decides to test a 2nd anchor, and then a 3rd. Finally, the right match of personality and style is found and an offer is extended. A client has developed a new way to put an expiration date on a perishable product, which can be customized in remarkable ways, depending on the neighborhood that it is sold in. But what should the message say, exactly? SurveyUSA helps the client pre-test multiple geographically specific tags, each of which takes a different approach to letting the consumer know how far the perishable item has traveled to get to the specific retail outlet. A town of 7,000 is divided on whether to use tax dollars to replace grass at the town’s one high school with artificial turf. Both those in favor and those opposed claim that a majority agree with them. A hyper-local place-blog that covers the town asks SurveyUSA to referee. SurveyUSA interviews residents likely to vote in a special election. Few residents are expected to vote. If turnout is heavy, maybe 1,700 votes will be cast, total. The challenges for a public pollster are enormous when the geography is this small. SurveyUSA predicts the measure will be defeated 4:1. The measure is defeated 4:1. Bullseye. A TV station hears from certain viewers that they cannot get a clear picture. The station determines that the complaints appear to come from just one small part of town. The station hires SurveyUSA to poll different parts of the viewing area, and compare the clarity of the received TV signal from one part of town to another. Armed with this data, the station adjusts its antenna and solves the problem. A town of 19,000 is divided on whether to allow casino gambling. The town calls a referendum. No one knows how it will come out. SurveyUSA polls the town and finds 65% support for the casino. The referendum is held: 64% vote in favor of the casino. Bullseye. ABC News completed one poll of 531 debate watchers. CNN completed one poll of 615 debate watchers. CBS News completed one poll of 655 debate watchers. SurveyUSA completed 35 separate polls in 35 separate geographies, of 14,872 debate watchers. NBC affiliates in Seattle, Salt Lake and Denver had scientific SurveyUSA reaction in-hand minutes after the debate, while Tim Russert and Chris Matthews pondered how many DailyKos bloggers had stuffed the ballot box at the MSNBC website. ABC News completed one poll of 612 Americans. CNN completed one poll of 639 Americans. NBC News completed one poll of 742 Americans. CBS News completed one poll of 1,241 Americans. 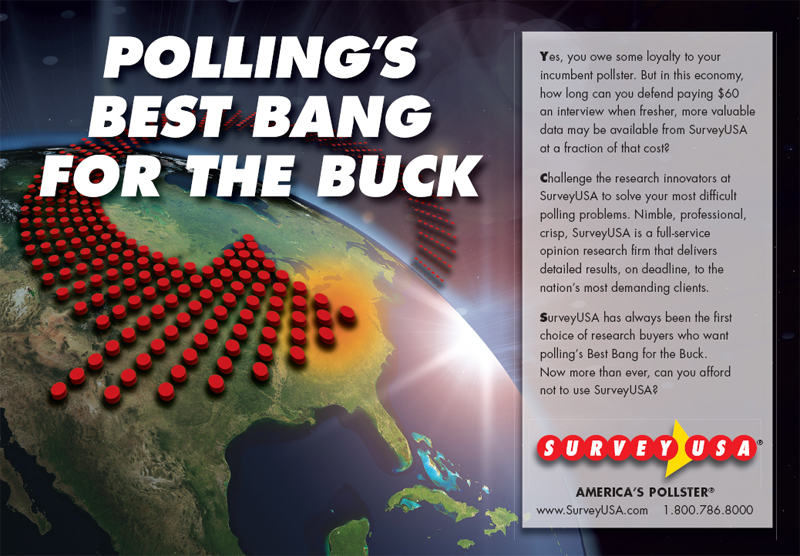 SurveyUSA completed 26 separate polls in 26 separate geographies, of 15,652 Americans. Ready to have your own success story? Put America’s Neighborhood Pollster™ to work for you.